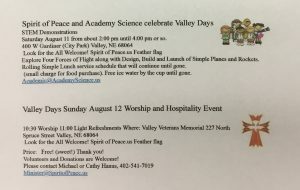 Valley Days I Am Celebration for the Community. Modern Song Focus on Contemporary Church Artists performing hymns of traditional foundation. 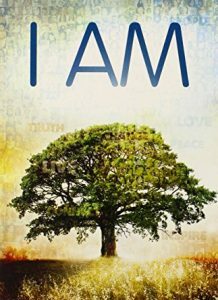 We see and hear the first “I am” statement from Jesus’ teachings in John’s gospel message today. I am the manna. I am the bread of life. God has provided His people manna, bread from heaven, just as Jesus fed 5000 with the loaves of bread. John wants to bring his message to us to trust in Jesus. In our reading from 1 Kings today, Elijah finds himself in the wilderness, crying out to the Lord to come take his life. Have we felt like this ever in our own lives? Chances are we may have felt so oppressed, in pain, or even consider ourselves so complete, that we cry out to the Lord, come take me. Would not eternal rest best anything we may experience here on God’s planet Earth? Of course our compassionate Lord sends angels to Elijah. May the Lord bless us all! The reading from the prophet Samuel today takes us into David’s life of violent experiences. David must come to grips with a son, Absolom, who threatens David’s life on the throne. David grieves the death of his son as only a father can. We can liken this to our Father God loving us unconditionally, even though we continue to sin. Although David could not restore Absolom, we trust that our Father God, can and will restore us when we turn back to Him in His forgiveness for our sins. In Psalm 34 David brings us a testimony, a life story, events in David’s life that formed his character. David needed the Lord to provide him with life or his life as he knew it would be snuffed out. As God delivered David, we must have faith God will deliver us. As Paul spoke to the Ephesians in today’s reading, he also speaks to us. In speaking to our neighbors, demonstrate love and concern. Old Testament: 2 Samuel 18:5-9, 15, 31-33. Prayer: O God, sustain us in the complexity of our humanity as you sustained David, playing the harp of youth, throwing stones at giant problems, loving our friends beyond wisdom, dancing worship, mourning children, breaking our hearts in psalms, and longing for warmth in our old bones. Amen. Friends in Christ, God invites us to hold the needs of our sisters and brothers as dear to us as our own needs. Loving our neighbors as ourselves, we offer our thanksgivings and our petitions on behalf of the church and the world. Hear our prayers, God of power, and through the ministry of your Son free us from the grip of the tomb, that we may desire you as the fullness of life and proclaim your saving deeds to all the world. Amen. I believe in God the Father Almighty, Maker of heaven and earth. And in Jesus Christ, His only Son, our Lord; who was conceived by the Holy Spirit, born of the Virgin Mary; suffered under Pontius Pilate, was crucified, died, and buried; He descended into hell; the third day He rose again from the dead; He ascended into heaven, and sits on the right hand of God the Father Almighty; from there He shall come to judge the living and the dead. I believe in the Holy Spirit; the holy catholic Church, the communion of saints; the forgiveness of sins; the resurrection of the body; and the life everlasting. Amen. (Book of Concord). Our Father who art in heaven, hallowed be Thy name, Thy kingdom come, Thy will be done on earth as it is in heaven. Give us this day our daily bread; and forgive us our trespasses as we forgive those who trespass against us; and lead us not into temptation, but deliver us from evil. For Thine is the kingdom and the power and the glory forever and ever. Amen. (Book of Concord). (Matthew 6:9-13). The Apostle John proclaims, If we confess our sins He who is faithful and just will forgive our sins, and cleanse us from all unrighteousness. 1 John 1:9. Most merciful God, we confess that we are by nature sinful and unclean. We have sinned against You in thought, word and deed, by what we have done and by what we have left undone. We have not loved You with our whole heart. We have not loved our neighbors as ourselves. For the sake of Your Son, Jesus Christ, have mercy on us. Forgive us, renew us, and lead us so that we may delight in Your will and walk in Your ways to the glory of Your holy name. Amen. 26 Now as they were eating, Jesus took bread, and after blessing it broke it and gave it to the disciples, and said, “Take, eat; this is my body.” 27 And he took a cup, and when he had given thanks he gave it to them, saying, “Drink of it, all of you, 28 for this is my blood of the covenant, which is poured out for many for the forgiveness of sins. – Matthew 26:26-28(ESV). Prayer: Bread of heaven, you feed us in the depths of grief, sin, and hostility. Nourish us with your word through the long hours of tears, and in the dawning awareness of our need for forgiveness, so that we may be redeemed by your steadfast love. Amen. The Lord bless you and keep you; The Lord make his face to shine upon you and be gracious to you; The Lord lift up his countenance upon you and give you peace. Numbers 6:24-26. The Service has ended. Go in Peace. Come Join Us for a Picnic in the Park! 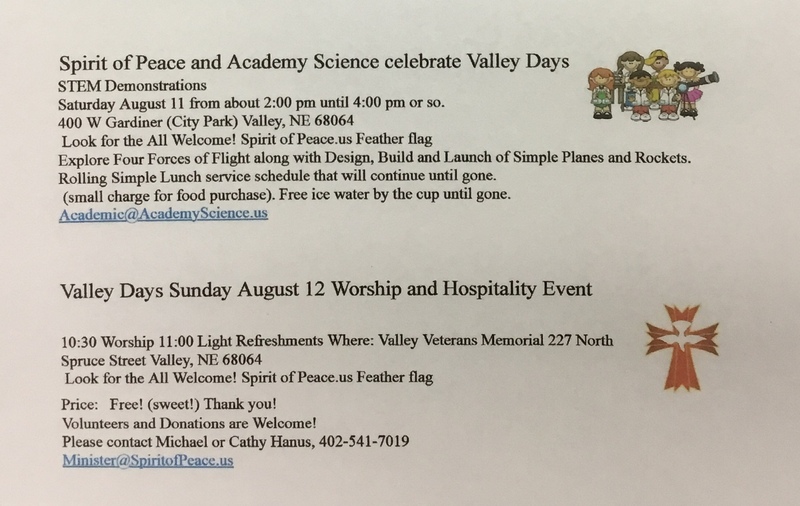 Look for the Spirit of Peace Feather Flag. A long time ago, twelve young men left everything to follow a promise, placing their entire future on a foundation of hope. That foundation was Jesus. Their future was the Church. Never meant to be an institution or political entity, that naive group of young men would later grow into a worldwide expression of God’s commitment to heal, save, and deliver. Church is NOT a building; it is People. It is where millions of People throughout the Ages have come to find Community, Rest, Peace and Remption through Jesus. ALL ARE WELCOME! Church is NOT for the Elite. It is NOT for the Perfect. Church is for ALL of Us. Church is a Place to Find Friendship and Purpose, where We can Meet Jesus and Rally around One Another. God, the Perfect Father, will never let us down, leave us, or stop loving us. Psalm 27. 2 Chronicles 32–33. John 18:19–40. Standing in the crowded store aisle, I struggled to find the perfect Father’s Day card. 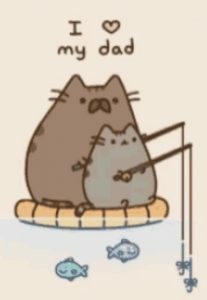 Although we had reconciled after years of a strained connection, I never did feel close to my dad. She stormed off before I could respond, so I prayed for her. Thanking God for affirming only He could be a perfect Father, I asked Him to strengthen my relationship with my dad. I long for deeper intimacy with my heavenly Father too. I want David’s confidence in God’s constant presence, power, and protection. Psalm 27:1–6. When David cried out for help, he expected God’s answers. Ps. 27:7–9. Though earthly parents could reject, abandon, or neglect their children, David declared God’s unconditional acceptance. Ps. 27:10. He lived with assurance in the Lord’s goodness. Ps. 27:11–13. Like most of us, David sometimes struggled, but the Holy Spirit helped him persevere in trust and dependence on the Lord. Ps. 27:14. We will encounter difficult relationships on this side of eternity. But even when people fall short, fail us, or hurt us, we are still completely loved and protected by the only Perfect Father. – Xochitl Dixon. Daily Bread. Lord, thank You for being a Father we can always count on. Self-searching is the means by which we bring new vision, action, and grace to bear upon the dark and negative side of our natures. With it comes the development of that kind of humility that makes it possible for us to receive God’s help, we find that bit by bit we can discard the old life, the one that did not work, for a new life that can and does work under any conditions whatever. – AS BILL SEES IT, pp. 10, 8. I have been given a daily reprieve contingent upon my spiritual condition, provided I seek progress, not perfection. To become ready for change, I practice willingness, opening myself to possibilities of change. If I realize there are defects that hinder my usefulness in A.A. and toward others, I become ready by meditating and receiving direction. “Some of us have tried to hold on to our old ideas and the result was nil until we let go absolutely” (Alcoholics Anonymous, p. 58). To let go and let God, I need only surrender my old ways to Him; I no longer fight nor do I try to control, but simply believe that, with God’s help, I am changed and affirming this belief makes me ready. I empty myself to be full of awareness, light, and love, and I am ready to face each day with hope. – Daily Reflections. © 1990. Alcoholics Anonymous World Services. I’m much too fast to take that test. Since most of us are born with an abundance of natural desires, it is not strange that we often let these far exceed their intended purpose. When they drive us blindly, or we willfully demand that they supply us with more satisfactions or pleasures than are possible or due us, that is the point at which we depart from the degree of perfection that God wishes for us here on earth. That is the measure of our character defects, or, if you wish, of our sins. – TWELVE STEPS AND TWELVE TRADITIONS, p. 65. 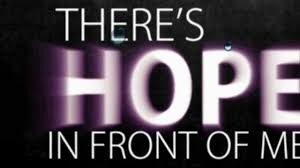 This is where long-term hope is born and perspective is gained, both of the nature of my illness and the path of my recovery. The beauty of A.A. lies in knowing that my life, with God’s help, will improve. The A.A. journey becomes richer, the understanding becomes truth, the dreams become realities and today becomes forever. As I step into the A.A. light, my heart fills with the presence of God. – Daily Reflections. © 1990. Alcoholics Anonymous World Services. Hope. Feeling of Trust or Expectation and Desire for a certain thing to happen. Filling all our lives with love and joy and peace. Bringing light and hope to every land and race. Although honesty is difficult to practice, it is most rewarding. Page 163. Basic Text, p. 96. How difficult we find it to be honest! Many of us come to NA as confused about what really happened in our lives that it sometimes takes months and years to sort it all out. The truth of our history is not always as we have told it. How can we begin to be more truthful? Many of us find it the easiest to be honest in prayer. With our fellow addicts, we sometimes find that we have a hard time telling the whole truth. We feel certain that we will not be accepted if we let others know us as we really are. It is hard to live up to the “terminally hip and fatally cool” image so many of us portrayed! In prayer, we find an acceptance from our Higher Power that allows us to open our hearts with honesty. As we practice this honesty with the God of our understanding, we often find that it has a ripple effect in our communications with others. We get in the habit of being honest. We begin to practice honesty when we share at meetings and work with others. In return, we find our lives enriched by deepening friendships. We even find that we can be more honest with ourselves, the most important person to be truthful with! Honesty is a quality that is developed through practice. It isn’t always easy to be totally truthful, but when we begin with our Higher Power, we find it easier to extend our honesty to others. Just for Today: I will be honest with God, myself, and others. – (c) 2018. NA World Services. Prophet Isaiah observes our coming to and practicing faith. We all observe a person coming to faith for the first time, whether a sudden transformation or a gradual process. We acknowledge that God is the most powerful concern in our lives. Psalm 147 is about praise. Praise the Lord. What more is there to say? God created the world and God will heal the world in its brokenness. Psalmist David uses allusion, or indirect reference, to make his point. Paul asks the Corinthians and us, What are we willing to do so that others can see God? The local temple was a gathering place for family Celebration as homes tended to be small. Use of the temple subjected the group to the temple administration. As we should, Paul ultimately owes his life to God, not those that provide him with financial support. Mark relates the details of Christ’s life. Jesus intervenes in the conflict between the power of evil and the power of God by doing deeds of power and preaching. Lifting, Raising, Healing. We should be there to witness and support our brothers and sisters as Christ the Healer is Lord and ruler of all. Psalm: Ps. 147:1-11; Ps. 147:20. New Testament: 1 Corinthians 9:16-23. Prayer: Perfect Light of revelation, as you shone in the life of Jesus, whose epiphany we celebrate, so shine in us and through us, that we may become beacons of truth and compassion, enlightening all creation with deeds of justice and mercy. Amen. 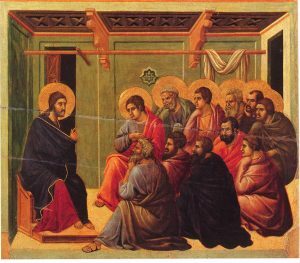 Prayer Intentions: To God who welcomes all in love, let us pray for the good of the church and the concerns of those in need. 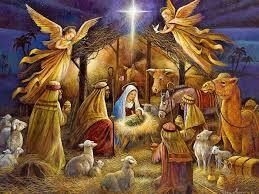 God of every land and nation, you have created all people and you dwell among us in Jesus Christ. Listen to the cries of those who pray to you, and grant that, as we proclaim the greatness of your name, all people will know the power of love at work in the world. 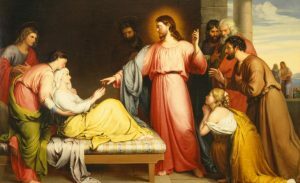 Prayer: Everlasting God, you give strength to the powerless and power to the faint; you raise up the sick and cast out demons. Make us agents of healing and wholeness, that your good news may be made known to the ends of your creation. Amen. to Celebrate Christmas and Share in Good Food and Fellowship! Your favorite food dish donation is welcome! Organized by: Spirit of Peace and the Health and Wellness Team. Pastors Cathy or Michael, 402-541-7019.